CHICAGO (AP) — Jay Bruce, Tim Beckham and the rest of the Seattle Mariners have opened 2019 on a power trip. Bruce hit two solo home runs, Beckham had a three-run shot among his four hits and the Mariners slugged their way past the Chicago White Sox 9-2 Saturday. Ryon Healy doubled in two for the Mariners, who are off to the best start in club history at 8-2. 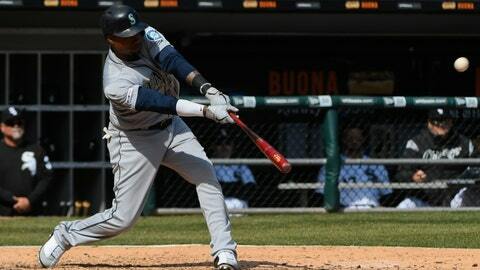 Seattle has homered in each of its first 10 games, a franchise first, and leads the majors with 24 long balls. “We’re clicking on all cylinders offensively,” manager Scott Servais said. “All the guys are buying into what we’re talking about doing, what’s important to us and our identity. That’s controlling the strike zone. Bruce, in his 12th major league season, is impressed. Tim Anderson homered and had three hits for the second straight game and Jose Abreu went deep for Chicago. Prized White Sox rookie Eloy Jimenez had his first three-hit game. Aside from solo shots by Anderson and Abreu, Mike Leake (2-0) allowed just seven singles through 6 1/3 innings as the Mariners rebounded from a sloppy 10-8 loss Friday in Chicago’s home opener. The veteran right-hander struck out six, and walked none as he threw 80 of 106 pitches for strikes. Three Seattle relievers locked it down from there. Connor Sadzeck pitched the ninth in his first appearance since being acquired from Texas. Lucas Giolito (1-1) pitched 4 1/3 innings and allowed five runs. He took a no-hitter into seventh inning in his first start Sunday at Kansas City. After Mitch Haniger’s RBI double in the third, Bruce homered and Healy hit his double to make it 4-0 in the fourth. Dylan Moore got his first major league hit during the inning — a single to center — but Leury Garcia threw out Healy at the plate. Abreu went deep in the bottom of the inning to cut it to 4-1, but Beckham homered to left off Caleb Frere in the fifth. Bruce hit his second solo shot in the ninth off Manny Banuelos for his 26th multihomer game. Mariners: INF/DH Edwin Encarnacion (left hand) returned to the lineup as DH after missing two games. … Servais held 2B Dee Gordon (tight groin) out the lineup after he exited Friday’s game in the fourth inning. Moore started in his place. White Sox: RHP Ervin Santana threw a side session Saturday, but manager Rick Renteria stopped short of saying the two-time All-Star might start Tuesday when the White Sox have an open slot in their rotation. The 36-year-old Santana signed a minor league deal with the White Sox in February. A baserunning miscue by Mallex Smith erased Domingo Santana’s first-inning single. Smith walked leading off, and with one out, broke toward second as Santana hit a line drive to right. Daniel Palka fielded it on a bounce, but a confused Smith retreated back from second base toward first a few steps before realizing the ball had dropped. He then took off for third without retouching second, allowing Palka to throw to second for a forceout. Mariners: LHP Wade LeBlanc (1-0, 6.75) makes his second start. He got the win over Boston last Sunday despite allowing six runs (four earned), seven hits and three walks in 5 1/3 innings. White Sox: RHP Ivan Nova (0-0, 1.29) will make his second start of the season. Nova was solid in a no-decision on his White Sox debut last Monday at Cleveland, allowing one run on six hits in seven innings.